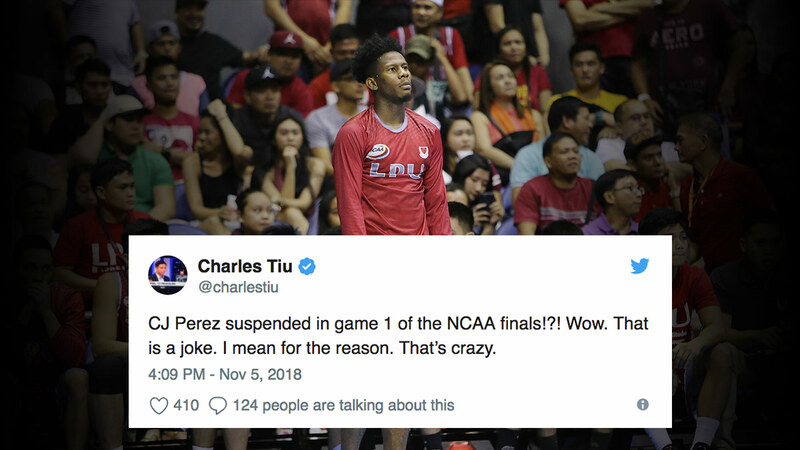 It's official: CJ Perez will not play for the Lyceum Pirates against the San Beda Red Lions in Game 1 of their best-of-three NCAA Finals rematch, which starts later today. The superstar forward was suspended after he applied for the PBA draft (where he was classified as a "Fil-foreigner") last October 29 without informing the league in writing—a decision by the Management Committee that was upheld by the NCAA Policy Board. According to SPIN.ph: "It is hereby resolved that the appeal filed by the Lyceum of the Philippines University in relation to Mr. Perez' violation of the NCAA rules is denied. The policy board further resolves that Mr. Perez is hereby suspended for one game on the scheduled basketball game on 06 November 2018." Lyceum, last year's runner-up, will definitely feel CJ's absence in the road to its first-ever championship. No wonder basketball personalities online have strong opinions on the game-changing development.